Berberine has been studied extensively as a replacement for the anti-diabetic drug Metformin. Not only is Berberine safer than Metformin, it is without the side effects. Besides lowering fasting and post-prandial blood sugar, Berberine also lowers other elevations common to insulin resistance, Metabolic Syndrome and diabetes: Hemoglobin A1C, blood pressure, LDL cholesterol, triglycerides and fasting insulin levels. Traditionally, Berberine has been used for more than 2500 years in both Ayurvedic and Chinese medicine. Additional to its use for Metabolic Syndrome and diabetes, Berberine is effective for cardiovascular ailments (congestive heart failure, cardiomyopathy, arrhythmias, reduction of atherosclerosis) and as an anti-microbial. It acts against bacterial diarrhea, intestinal parasites, fungal infections, Candida albicans, yeast, and possibly methicillin-resistant Staphylococcus aureus. Notably, recent research demonstrates Berberine protects against brain inflammation. It not only improves cognition and learning, it is shown beneficial for depression and Alzheimer’s. 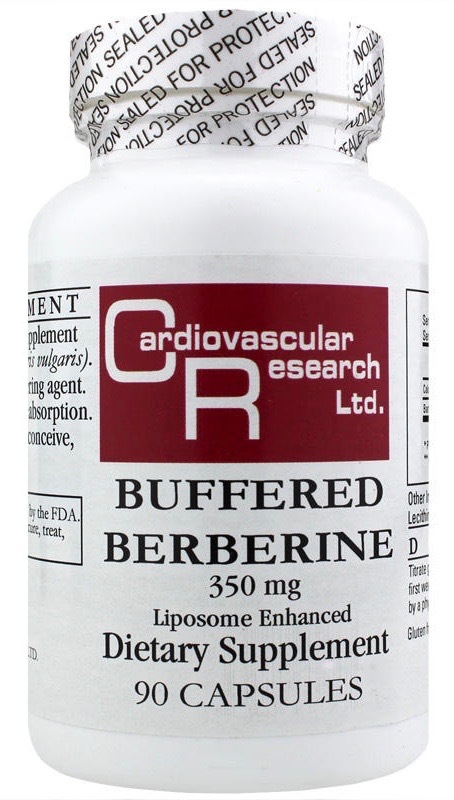 Cardiovascular Research’s liposomal delivery ensures Berberine is maximally absorbed. Take one capsule of Berberine, 350 mg, with 2-3 meals daily. Be aware that more than 1,000 mg Berberine per day can cause hypoglycemia.